Soccer star Honda Keisuke (25), who is currently playing for CSKA Moscow, is the new CM character for Asahi's sugarless mint tablets 'MINTIA'. 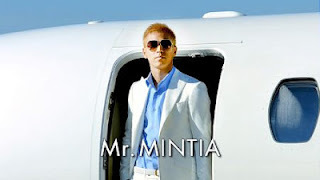 In the CM, he is known as Mr. MINTIA and the catchphrase he uses is 'Ore wa motteru' (I have it). There are two versions of the CM. The first one shows him stepping out of a private jet to meet his friends while the other one is of him dining on a gorgeous ocean-view garden. The CM was filmed in Los Angeles and started airing on the 5th. As part of the campaign, 20 men in white suits and sunglasses similar to the one Honda wears in the CM gave out samples outside Parco Shibuya on the 4th. 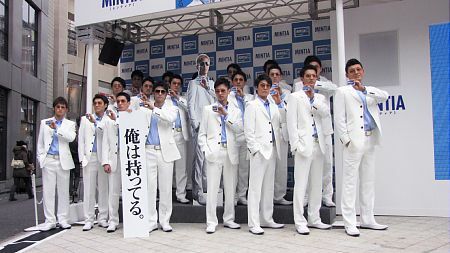 Asahi has also set up a Mr. MINTIA fanclub where members can win goodies such as tickets to soccer matches in Europe, Mr. MINTIA's sunglasses and the MINTIA MP3 player.